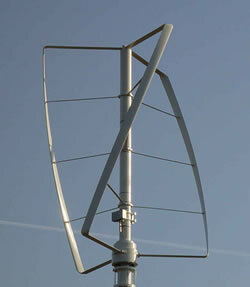 Small wind turbines are turbines with a maximum blade-height of 49 feet (15 meter) and generate relative low power. Their purpose is to use them in urban areas, but can be placed in any location. They claim to (partially) provide power for peoples own household. 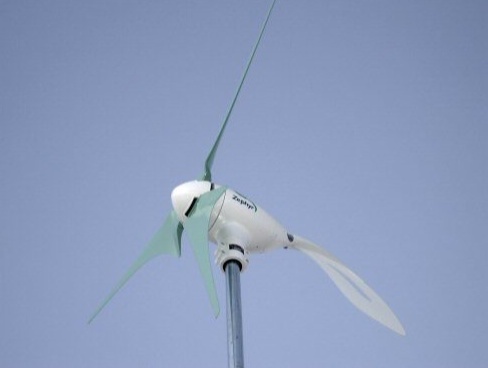 Little is known about the real performance of these small wind turbines. 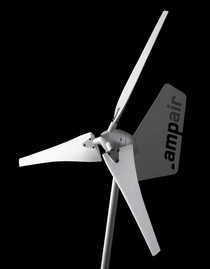 So 4 Dutch groups decided to start a project to test these small wind-turbines. Recently the first test results were published on the internet. After some calculations by OliNo we got some interesting results. The results show that a photovoltaic (PV) system is more cost effective than the best performing small wind turbine…. 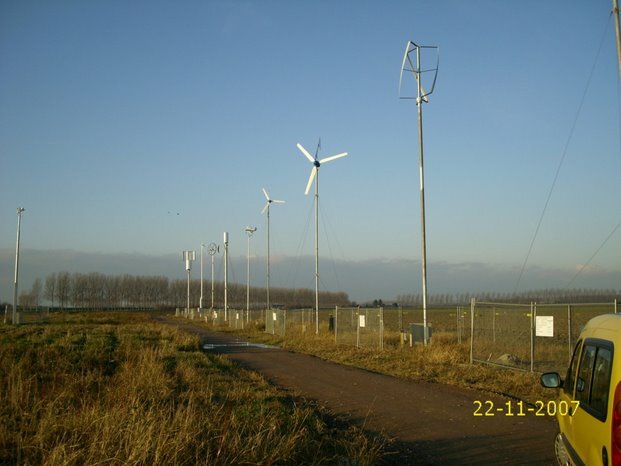 In 2005 four Dutch groups started together the project (Dutch website) to test the real performance of small wind-turbines. The groups are: DELTA N.V. (power-company), Provincie Zeeland (local government), Gemeente Sluis (local government) and stichting Zeeuwind (wind-power cooperative). Some time later Greenlab, a joint venture between ENECO and Greenchoice (both power companies), joined the project. The project is run by this unique co-operation of these five groups. They found a good location for the tests in the Technopark in Schoondijke (Netherlands). The location is near the Dutch coast. There are several reasons why this location is suited: The average wind-speed is high compared with a location inland and it is an open field with no obstructions. Electricity production in urban areas which are less windy and have more obstructions will therefore be lower compared with the test field. The test field is part of a unique experiment. This is the first time that several wind turbines are tested at the same time, in the same test field with the same wind conditions. This makes it possible to easily compare the wind turbines with each other on efficiency, reliability, cost of ownership, impact on the environment and sound pollution. This test shows if these small wind turbines are economical / technical feasible and fit into geographical planning. It is important to have renewable energy generation and if this test has positive results this may stimulate more renewable power installations. On 7 November 2007 the test field was officially opened by Marten Wiersma, the deputy of the Province Zeeland. After the start signal the test started. During the first period of the test some some wind turbines have some start-up problems and needed to some adjustments to generate good test results. 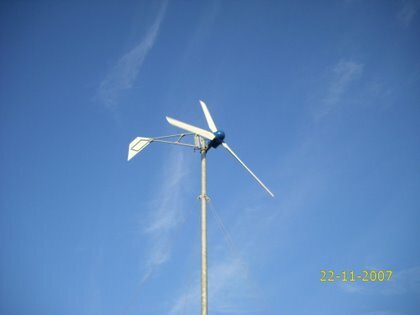 In an agreement with the participants it was decided to not include the test results of this first period (until March 2008) and give the participants the opportunity to adjust their wind turbines where necessary. The first test results (Dutch report) do not look to good. The amount of electricity produced by the wind turbines in the period between April 2008 an September 2008 is shown in the table below. To get a better insight in the cost efficiency of these small turbines I have extrapolated the numbers. I assume that the expected life-time of these wind-turbines is at least 20 years and that they will operate with the same efficiency as during the test period. I do not take into account the additional costs like maintenance. With these assumptions I can now calculate the price of the generated electricity per kWh. 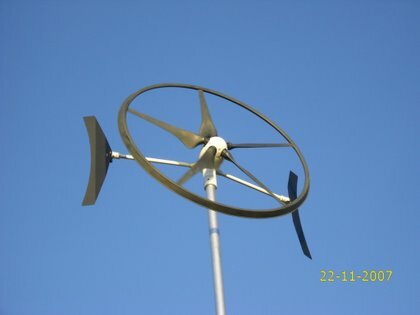 An 2MW wind turbine like the Amstelvogel of wind cooperative the Windvogel cost € 2.104.600. The yearly production is 4.4 GWh. With an expected life-time of minimum 15 years the price is € 0,032 per kWh. I did not take into account, as with the small wind turbines, the maintenance costs of the turbine to make a fair comparison. I also did use a Net Present Value calculation to keep it simple. Future cash-flow like maintenance and changing price of electricity are not included in the calculations. Lets compare the price per kWh with a photovoltaic (PV) system. I assume that the PV system has a minimum life-cycle of 25 years. Let take a 2500 Wp PV installation with a cost price of € 5,- per Wp. The yearly production is around 2250 kWh. This results in a price of € 0,22 / kWh using a life-cycle of 25 years. 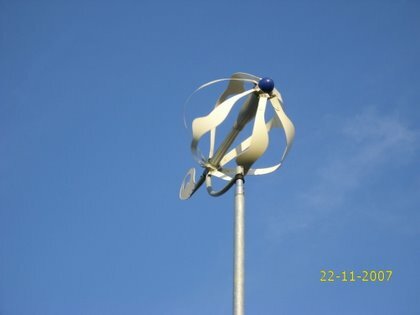 The production results of the small wind-turbines in the first test period are disappointing. The results show that a PV system is more cost effective than the best performing small wind turbine. I think the Airdolphin only costs 4-5000 Euros installed. In this case the cost/kWh would be a lot less? If the price is indeed that low the cost per kWh goes down to € 1,39 per Kwh. However, the price I mentioned is from the test report. This is the price you have to pay for the Airdolphin in the Netherlands. Where did you find a price of around €4500,-? FYI — First Solar has installed cost of $3.50/watt on a PV system, much lower than the 5 euro/watt calc you used. It is unfortunately for the Europeans a well known fact that prices for PV are a lot higher in Europe compared to prices in the US. See also the Photovoltaic Module Survey Retail Prices overview on the SolarBuzz website. When you calculate with these lower PV prices the conclusion gets even stronger. PV is more cost effective than the best performing small wind turbine. The wind turbines don’t out perform the PV because it hasn’t been windy enough. With such average wind speed I wouldn’t recommend a wind turbine installation to my client! That’s simple but seems no one took that into consideration. It is well known that a 3.5m/s wind speed average is not good for wind generation. This review is obviously written by a PV man. I have myself more then 12 years experience with PV (Siemens). Life cycle is 1 – 10 years, when you are lucky, and not more. With calculated expectations of 25 years, you first have to prove that. My experience is that after a couple of years the diodes explode or you get unexpected hot spots. All not repairable. You also have to mention in your calculation which type PV your are using. Mono Chrystaline, which I suppose, has another price tag. The only ones with some good results. Please, when you like to compare PV with small wind generators do that only in relation to small PV plants. After 12 years I know for sure that even te worst small wind generator is probably much more price efficient then any small PV plant. The price calculation is very important in this experiment. So it is not right to use the distributors price. A simple google-find gives clear net cost prices for the generators. Erecting these generators is, in an experiment, like this one, for all the mills nearly the same effort, so forget about that or use for the calculation a fixed price, the same for all of them. Then you will find to your surprise, that f.i. the Ampair 600 costs net around 2300 Euro and the Skystream a little bit more 9000 Euro (both net). Conclusion forget about these test results when it concerns kWhr cost efficiency. Or repair those results. Windgenerators are much more price efficient then PV. Regarding your remark about the product life of PV. It is a well known fact that large PV manufactures like Kyocera have 25 years warranty on power output of their PV panels. See one of their product sheets for details. It doesn’t make sense for them to give this warranty when their product fails within 10 years. It is however true that separate inverters are used to convert the solar generated power (DC) into the grid (AC) last around 10 years. The price of the inverter is low compared to the full PV system and can easily be replaced. Regarding the prices calculations. I indeed used the given distributors price (in the test) because I wanted it to compare with the price of my own PV installations. For this PV installation I also paid the distributors price. You mention that I am a PV man. This is partly true because I like all efficient renewable power sources. This is also one the the reasons that I am highly active in the Dutch Wind cooperative De Windvogel. As I have shown in this article, large wind turbines are highly cost effective, especially compared with small wind-turbines. There is a lack of information about the wind it has been taken. The cost efectiveness will depend on that and on the location local wheather conditions. It includes also the PV systems with the presence of shadows and latitude. But, in general, in small wind turbines installations usually it is not possible to get wind measurements during a significant periode, while PV is always more predictable. In addition, PV technologies are smaching the records of cost efectiveness every month, while wind turbines are already nearer their technological optimum. In the test report you can find the average windspeed during the test period. Taking a look at the test results, the average wind speed was 3.5 m/s. I’m from the USA and that converts to 7.893 miles per hour. From what I understand you need wind speeds of 8 to 12 miles per hour in order to financial justify an install. However, the measurement site is located near the Dutch coast, so you would expect good wind. I have added a map of the test site in the article. I think the annual average wind speed in that area is well over 5m/s , or ? @Lars, very good remark! An year averaged windspeed of 3.7 m/s is TOO low for that area near the Dutch coast. So I started investigating and found an official weather measurement station (KNMI Vlissingen) located 14 km away from the test site (also near the coast). They measured an average windspeed during the same period of 6 m/s. This makes a huge difference. So now I try to contact the projecleader of the test site and try to get some explainations. I will publish an updated article with all the details when I know more. I’m new to this forum, so forgive me if my questions sound a bit dated. I am in the US (northern New Hampshire). I recently installed a V100 Energy Ball at a customer’s residence, based on a 1-year wind study that proved there was sufficient wind to justify the Energy Ball. It is working well, but I wouldn’t recommend it for large-scale residential use; there is simply not enough wind at or near rooftop level. Question for Jeoren van Agt: Do you have any further information about the comparison test? Has any more data been published? Are you aware of any other comparison tests which have been completed or are scheduled in the EU? (well, OK, 3 questions). Next question for anyone: The charger and inverter for the V100 and V200 Energy Balls have RJ11-style data ports. Does anyone know what data is available at the port and how to access or read it? I’m assuming that it is RS232. Thanks. Good questions. I just checked the Dutch website of the small wndturbines test and it is down for maintenance. I will check later if I can find more up to date data. Interesting to hear that you wouldn’t recommend the Energy Ball for large-scale residential use. 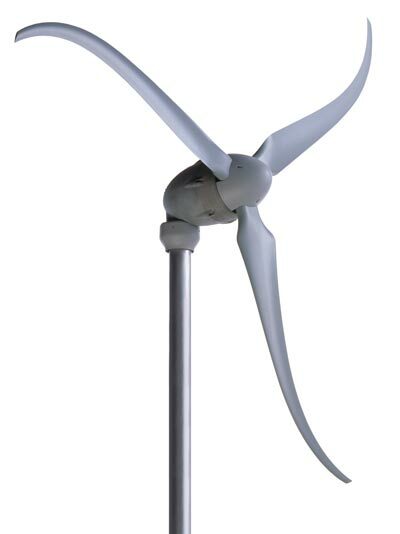 Do you have some measurement data (amount of kWh produced) of the installed windturbine? Do you have a wind measurements report about the wind speed in your area? Is it comparable with the test field in the Netherlands? About your question about the RS232 interface. What is the brandname and type of the inverter used for your Energy ball? When I spoke of large-scale residential use, I meant residential neighborhoods; single family homes. Wind at the roof tops is well below that found at the test site. A 10m or 15m mast helps a bit, but New Hampshire is heavily forested, even in many residential areas. I’m going after customers who already live off-grid and are in areas well away from and above the tree line. But, I won’t sell any wind product without a 6-month to 1-year collection of wind data; wind maps are not very useful, in my opinion. The only unit I have was installed two weeks ago and I don’t have any meaningful data yet. As it accrues, I’ll share it on the forum, if anyone is interested. The inverter and charger used with the Energy Ball is manufactured by Home Energy (in NL or Sweden) and delivered with the Energy Ball. When you buy an Energy Ball, you choose either a grid-tie inverter or a battery charger. Do you have some contacts within Home Energy? Is there any news about the message nr 14? I am doing my research at TUDelft which involve the prices of wind turbines and solar cells [$/Watt]. So any updates would be very useful. Excellent test results. PV is diffidently more cost effective than Wind Turbines, not to mention the need of a higher wind speed, maintenance, etc..
Good day and welcome to my blog . I’m Alanis Patton. I have always dreamed of being a book writer but never dreamed I’d make a career of it. In college, though, I aided a fellow student who needed help. She could not stop complimenting me . Word got around and someone asked me for to write their paper just a week later. This time they would pay me for my work.